There's a Strat for just about every scenario. From 'classic' treatments at any price point to vintage replicas, signature models, hot-rodded modern instruments and understated metal monsters, our buyer's guide rounds up the best Fender Stratocasters currently available. 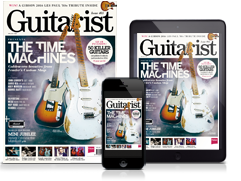 Now in its 60s, the Strat remains the world's most iconic guitar, and continues to be synonymous with the very concept of an electric guitar, regardless of genre. With each new generation, the instrument has been honed and retooled to do the work required of it, building on an ever-expanding legacy. Fender's updated mid-priced Player Strat features a satin neck, an updated two-point vibrato design, plus three new Alnico V single coils. The latter recall Fender’s fat Texas Hot single coils and respond beautifully to gain, and treble loss is minimal when rolling back the volume knob. The bridge pickup, which can be weedy on mid-priced Strats, is rich yet cutting - and if it’s still too spiky, the pleasingly responsive tone knob will enable a fairly precise treble cut. By their very nature, Strats will always pay homage to the past, but this particular edition packs tones that span the decades and bring the format bang up to date. Vintage purists won't like it; many, many players will! Fender's rebadging of the old Deluxe range adds new colours, a refreshed headstock logo and 'soft touch' rubber control knobs, plus a new neck shape, a wheel-style truss-rod adjustment and slightly altered-shaped heel geometry. Then we have the latest (fourth) generation of Noiseless pickups controlled, as before, by the S-1 switching, activated by a push/push switch within the top of the volume control's knob that expands the sounds from the five-way or three-way pickup selector switches. Selecting the middle pickup and switching in the S-1, for instance, it's as though you've kicked in a thickening boost: more humbucking, with more power and low end, plus there's a little 'cocked wah' to the highs. Its voice is nicely classic: engage the S-1 switch and it's 'game on' for those of us who find a Strat a little hard work. How many playing careers have been launched on a Squier Affinity Stratocaster? Perhaps the ultimate beginner guitar, Squier's current incarnation offers the kind of specs that will have you double-taking when you see the price. An alder body, maple neck and rosewood fretboard (though you can opt for maple) are paired with single-coil Strat pickups, plus a comfortable 'C'-shaped neck that will help grease the wheels of burgeoning players in a variety of styles. It might not have the bells and whistles feature sets and high spec components of some of the models here, but considering the Affinity costs approximately one fifth of some of those guitars, we shall leave the cork-sniffing aside and instead praise the accessibility and feature set of what is more than likely the world's most popular first guitar. Beginners have never had it so good. This upgraded Deluxe model features an alder body and bolt-on maple neck, with the option of maple and rosewood fingerboard, finished with satin polyurethane. Keep sniffing around and you'll find other features like the 'Modern C' neck profile, 22 narrow/tall frets, a contoured neck heel, synthetic bone top nut and a set of locking tuners with vintage-look buttons. The new Roadhouse features three Vintage Noiseless (1st generation) single coil-sized humbuckers wired to a five-way pickup selector blade switch, and master volume and tone controls. Lurking between the volume and tone knobs is the V6 preamp control, a six-position rotary switch that gives you access to a series of tweaked single-coil tones. Plugging in the Roadhouse reveals a slew of classic Strat tones. The pickups exploit the natural tone and woodiness of the guitar, while the Noiseless aspect lives up to their vow of silence, making them indispensable in a recording situation. As a result, bar metal, this is the best Strat for just about all scenarios. The definition of the original modded Strat, the HSS takes the American Pro Strat platform and adds a Shawbucker 1 at the bridge. It's a pretty classic vintage-spec, low-output humbucker using an Alnico 2 bar magnet, 42 gauge plain enamel wire and unpotted coils "to capture every nuance of your style", says Fender. The HSS has a less pushy character than the SSS Strat, which sounds beefier in the lower mids with a little more separation, clarity and percussion. The bridge/middle mix is a little muted, less stringy - in a good way - while the nicely balanced bridge humbucker smooths some of the spikier highs and nails a more classic rock voice into a crunchier gained Marshall-like amp channel. Rather than being period-correct reincarnations, Fender's Original series aims for a ‘best of decade’ vibe. So, this Strat is alder bodied with a ‘round-laminate’ rosewood fingerboard that was implemented in mid-1962. In a mid-'60s style we get Pure Vintage ’65 Gray-Bottom single coils on an 11-screw mint-green pickguard with aged white controls. Meanwhile, a concession to modernism is the second, lowest, tone control, which originally would have been for the middle pickup, but here works on both the middle and bridge pickups. Another 'modern' inclusion is the ubiquitous five-way lever switch, which didn’t actually replace the original three-way switch on the Stratocaster until 1977. You’ll find these ‘fixes’ on many Fender Custom Shop models, of course, but while these don’t come with any ageing or relic’ing they are significantly cheaper. If you hanker after a new USA-made production Fender and want the most vintage-spec possible, this is now it. Vintage-inspired, yes, but with the fixes that many players will embrace, this is one of the best classic Fender Stratocasters outside of the Custom Shop. Stealing from the rich archives of Fender and giving to the poor (ie, us), the Classic Vibe Strat offers '50s specs - maple fingerboard, single-ply pickguard - with contemporary playability, courtesy of the gloss-finished C shape neck, complete with skunk stripe down the rear. The sound of the Strat is so ingrained, you know when it's not right; fortunately, Squier has captured the model's tonal mojo to a tee. Each of the five pickup positions is snappy with a woody midrange that's quintessentially Strat. The cool neck, mellow middle and sharp bridge are all fine examples, but the stars of this Strat are the in-between positions; if you want to get your Nile Rodgers on, just plug in a compressor and let fly. The pickups are good overdriven performers, too; the maple 'board lends a little extra sizzle, which helps them to cut through. The spec will be sacrilegious to purists! This Iron Maiden-approved Strat has an air of refinement - a sober, classy aesthetic complementing a nuanced, classic rock tone. But make no mistake: with two Seymour Duncan Hot Rails stacked humbuckers in neck and bridge, and a JB Jr in the middle, there's plenty of firepower on offer. Given that Maiden's increasingly progressive sound makes all sorts of demands on Murray's gear, we're not surprised by the harmonically rich bark of the bridge 'bucker through an all-valve head, lending a fiery heat and squeal to solos. That said, it also has some unexpected sweet spots when the signal is just pushed to breaking point. Ultimately, the Dave Murray Stratocaster is one of the best options at this price for metal, with plenty of crunch and scream and a top quality vibrato, arguably trumping Murray's US-built signature model (retailing at more than twice the price) with regards functionality and versatility - if not outright quality. The newly launched American Performer Series represents the most affordable entry point to bona fide USA Fenders, and marks the Big F’s first refresh at this price point in over 10 years. The big changes lie in the all-new pickups that come fitted to all models in the range, in this case Yosemite single coils and the associated electronics. Pulling up on the bridge tone control allows you to engage the neck pickup along with the bridge and middle pickups for two additional tones, while a reverse-wound, reverse-polarity middle pickup allows for hum cancellation in positions two and four. Make no mistake, a blendable neck pickup is a hugely welcome addition to the Strat’s tonal arsenal, and these are some of the best single coils we’ve ever heard, with a beautiful sense of compression that gives them the edge over cheaper models. If you’re after a workhorse Strat with a bevy of additional tonal options, not to mention rock-solid, smooth-operating hardware, this is a strong Performer indeed. Radiohead's Ed O’Brien has crammed his ‘designed-with’ Sustainer Strat with tech while staying as faithful to the traditional Strat look as possible. The headline-grabbing addition is the Fernandes Sustainer, which provides the key to the alternate realm of guitar tones that awaits. Complementing that there's a Texas Special Strat single, which packs an overwound, beefier character than your vintage Strat types, plus a Seymour Duncan JB Jr single coil-sized humbucker in the bridge, meaning there are a lot of tones in this guitar. The neck is excellent, too: a more palm-filling V than the generic C we’ve come to expect from Mexican-made Fenders and provides an extremely comfortable, chunky feel, bolstered by an engaging light satin finish. 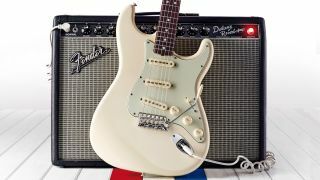 In many respects, the EOB Stratocaster isn’t a revolutionary guitar - after all, the Sustainer itself has been around for decades - but in pairing its namesake system with a hugely versatile set of pickups and a classic outline at a sub-£1,000 price point, Fender has produced a guitar that will appeal to players from all sonic walks of life.